Last weekend’s THATCamp LAC had many wonderful sessions full of discussions. One of those sessions was “Is there a tech in this class?” which became a show-and-tell of favorite online tools, in about five minutes each. I gave a quick overview of my Google Reader workflow, based on an old blog post I had stumbled across a couple years back about optimizing one’s Google Reader experience. Instead of sorting your RSS subscriptions into folders by subject, sort them according to how frequently they have new posts and how much you want to read them. This way you will always go through your most important and/or timely articles first, saving the not-so-important articles for a more leisurely time. In the screenshot here, I’ve numbered my folders according to how often I try to read them. “1 Daily”, “2 EdTech”, and “2 Skim” are all folders that I try to look at everyday if I can, but I will settle for a purge every few days if necessary. The feeds in “1 Daily” post something new at least once a day, if not more frequently, and their posts usually require more attention than a quick glance. This includes the wonderful book reviews from The Millions and CultureLab, ebook news from No Shelf Required, plus musings and links from Text Patterns. The folder “2 Skim” has crazy ridiculous feeds that have, on average, well over 100 new posts every week. I subject myself to these feeds because I feel that an important part of my job is staying up-to-date on tech trends so that my colleagues don’t have to. To that end, I have things like ReadWriteWeb and Lifehacker here. There are other more techie, and even more prolific, news feeds I could subscribe to but I’m not that big on punishment. One of the benefits of lumping feeds together in folders like this – after skimming through the headlines to star or Instapaper those that interest you, you can then use the magic “Mark all as read” button to clear all the other posts away. Ta da! This way I funnel the posts I’m most interested in to my Instapaper feed, which I also subscribe to in Google Reader, but I keep it separate from any folders. After I’ve quickly cleared out a couple folders, I can go into my Instapaper articles knowing those are the things I want to spend more time with. Up to this point, each folder has only had a handful of subscriptions since the respective feeds all delivered so much content. For the folders “3 Weekly” and “4 Monthly” the RSS feeds have maybe 5 new posts a week, and although they’re very informative, I don’t mind letting them pile up to be combed through once a month over the occasional weekend with downtime. 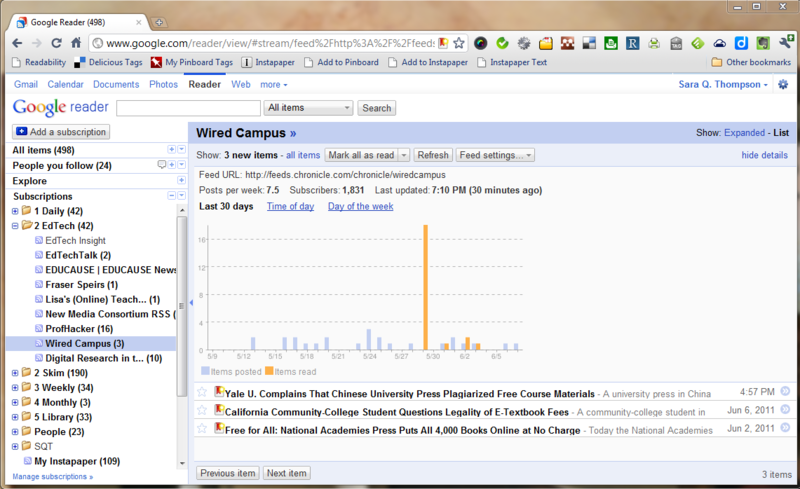 The folder “3 Weekly” has a miscellany of things like Google for Students, FlowingData, BookTwo and about 30 other feeds. And, yes, I do still have two subject folders after all. Two reasons for this: 1) my Library folder is huge, with about 60 different feeds. Fortunately, none of them post more than a few new items each week, and some only post new items once a month (journal TOCs). This, too, is a folder that I will save for those weekends when I do a lot of RSS catch-up in one go. 2) my People folder is the special place for friends I know in real life who have personal blogs. I don’t want these posts getting lost in the shuffle of skimming folders so I keep them in their own cozy corner. 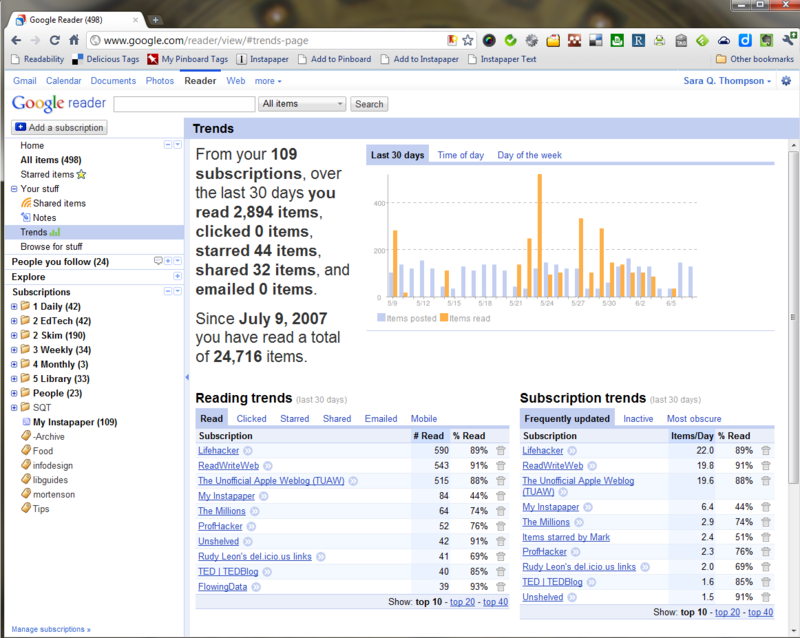 You might be asking, “How do I know which feeds are which?” Google Reader has a couple handy dandy tools for this. 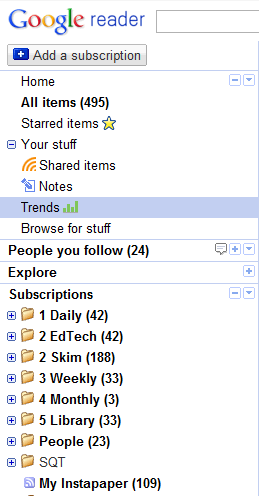 Log into the web version of Google Reader, click on Trends from the sidebar. Toward the bottom of that Trends page, you should see a column for Reading Trends and one for Subscription Trends. These columns tell you which feeds are most active (Subscription trends) and which feeds you interact with the most (Reading trends). Unfortunately, the information is only for the last 30 days so ask yourself how typical the past month has been for your reading habits and take the stats with a grain of salt. To see how often a specific RSS feed has new articles, click on that feed from the Subscriptions area of your left sidebar, then click “Show details” to see how many posts per week you can expect from that subscription. I’ve started using this information in evaluating new feeds before committing to them. If a feed has truncated posts and spits out more than 10 each week, I probably won’t be following unless it’s REALLY good. I do my actual reading on my iPad, and I’ll be looking at my two favorite RSS apps – Reeder and MobileRSS HD – in a future post. Oooooh! So much to look into. Applications to my little world are budding as I read…Thank you!